The Universal Shaiva Fellowship is happy to announce the Birthday Celebration of our beloved Gurudev, Swami Lakshmanjoo on Thursday, the 9th of May, at our Culver City Center. You are cordially invited to come and joyously celebrate this auspicious day. Puja (Worship) begins at 10.00 a.m. followed by the singing of sacred Shaivite hymns, which were loved and taught to us by Swamiji. The day culminates with the taking of prashad (holy food blessed by the master) consisting of very tasty traditional Kashmiri vegetarian dishes. 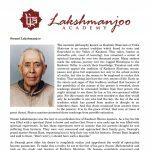 Though Swami Lakshmanjoo was a master of Sanskrit Language and completely versed in all systems of Shaiva Philosophy, his teachings were always expressed in simple language, accessible to the sincere aspirant. “Trika philosophy is situated in the heart of that supreme energy of God consciousness. “God and the individual are one, to realize this is the essence of Shaivism”. 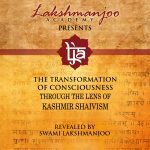 The knowledge presented herein constitutes the treasured secrets revealed by Swami Lakshmanjoo over a period of two decades, (1971 to 1991). These revelations form the foundation stone for ‘uniting individual consciousness with Universal God consciousness’. 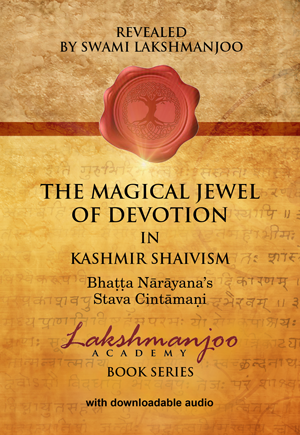 The Trika philosophy of Kashmir Shaivism is beautifully expressed in the first verse of Shivadristi, composed by the great Shaiva Master Somananda, founder of the Pratyabhijnana System of Shaiva Philosophy. Here, Shiva bows to himself, for the removal of obstacles, which are also Shiva, through his own energy (shakti) which is one with Shiva, and in the end He resides in the state of universal Shiva. That is the state of Para (Supreme) Bhairava! In Trika Shaivism, although the word ‘Trika’ indicates three, everything is found in a state of oneness. From the Trika point of view there isn’t the slightest difference between individual soul and Lord Shiva, it is just a play, a drama of His own nature. The philosophy of Trika Shaivism is unique and original. For the sincere seeker of Truth it holds the wonderful vision of the whole world as real and not illusion. Trika philosophy teaches that this world is nothing but the blissful energy of the all-pervading consciousness of Lord Shiva. May the grace of Lord Shiva shine upon you.